Two campaigns are hoping to make waves this year in celebration of 50 years in business: Doritos and Peet’s Coffee. Doritos takes on another crowdsourced concept and Peet’s focuses on bold creative and vivid imagery. Taking a page out of their own book, Doritos is inviting fans to get involved. They are hoping fans will break at least 50 world records, all of which must involve Doritos, such as building the tallest house of cards using Doritos chips. Keeping with their Super Bowl tradition, Doritos launched the campaign the same day as the big game. They hoisted 22 chip lovers 14 stories into the air and achieved the “Tallest Suspended Football Party” (i.e. tailgate). The company will also create new records for consumers to break. Here’s to some great record breaking flop videos – because watching someone get hit in the face or falling trying some strange stunt is fun for everyone. Taking a more serious angle, Peet’s Coffee hits home with truth and eye-catching design. Utilizing the newer cinemagraph* technique, short videos and some outdoor creative, Peet’s bright designs on dark backgrounds are attention grabbing. 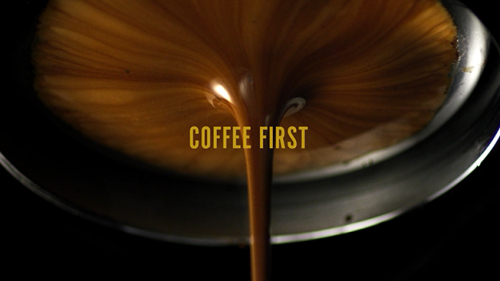 And the tagline makes the campaign even stronger, “coffee first, everything else second.” It plays upon the popular saying, “coffee first”, evoking that feeling when you get your first cup of coffee in the morning combined with beautiful images that reflect the brand’s true commitment to coffee. In addition to the beautiful imagery and strong tagline, Peet’s is launching the hashtag #NoFooling on social media. The campaign will be centered around April Fools’ Day (the brand’s actual 50th anniversary) and star Peet’s employees on polygraphs. Peet’s strong commitment to honesty and coffee is their driving force. Now, go make a hilarious viral video trying to catch a Doritos chip in your mouth. Or, if you’re feeling lazy, just grab a cup of Peet’s Coffee – it’s hand-roasted for Pete’s sake! *Guilty plug: z2 uses this video approach for clients. Ask about it today!